Hello! 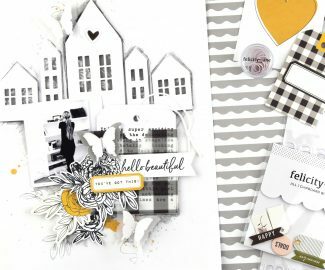 The sweet Amber – Felicity Jane November 2018 kit inspired a mini album full of my favorites from this month! I love the soft pinks and mint with a splash of gold. The whole collection just feels warm and cozy, and the puffy border strips and ampersands are SUPER cute! I started with some blank tags and the photos I wanted to include. 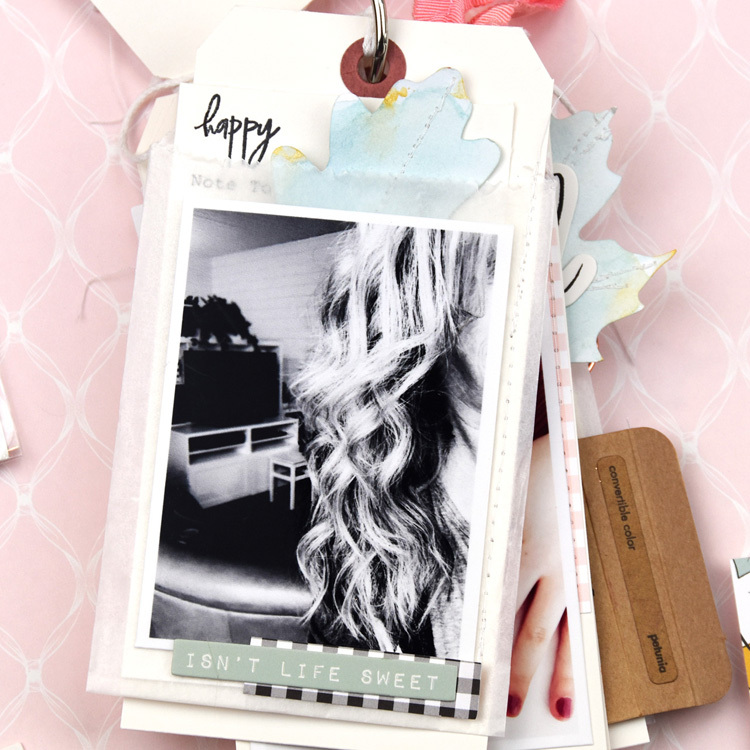 The first page has a hair selfie with the journaling tucked into a glassine bag. 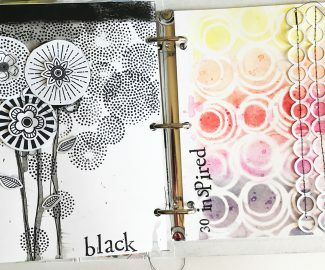 I used the happy stamp from the Amber stamp set at the top of the typed journaling; I added a strip of paper and a die cut at the bottom. Tucked inside the bag is a Felicity Jane cut file leaf that I painted. Tag 2: I stitched the journal card onto the tag to make a pocket. 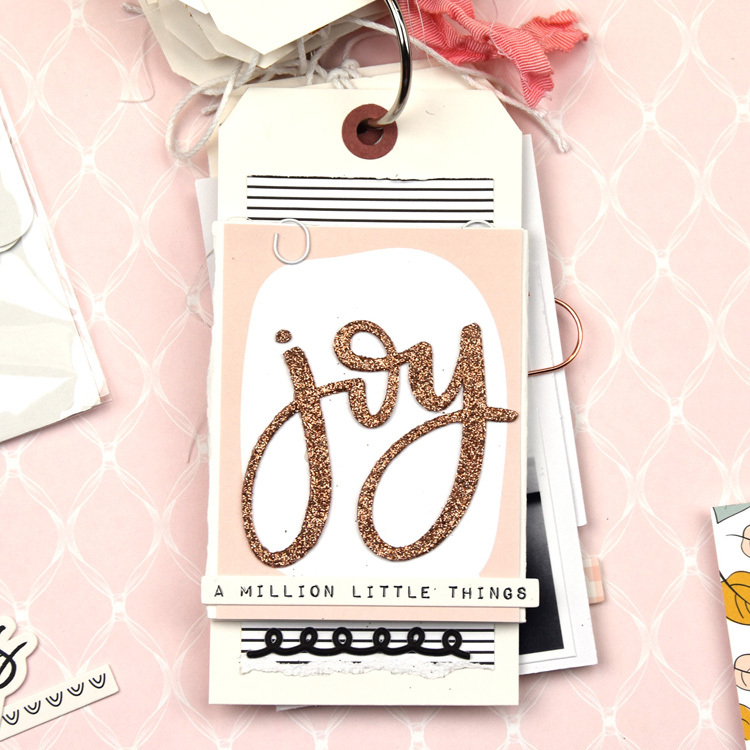 I added some pretty ribbon to one of the die cut Amber tags and tucked it in! 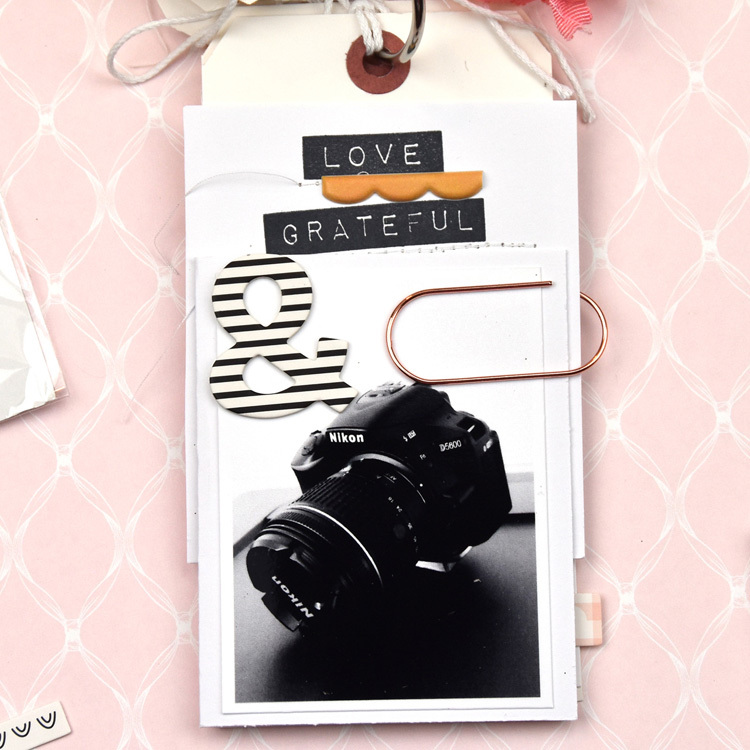 A photo and chipboard and button finished off the tag! 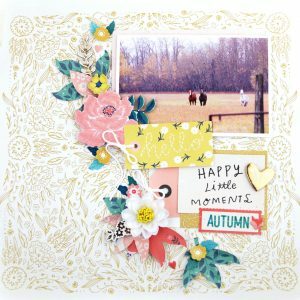 Tag 3: I added gold texture paste through a star stencil, a painted FJ cut file leaf and the beautiful “thankful” die cut. Tag 4: I added some stiched tissue paper to the floral die cut tag and popped a chipboard ampersand on top! Tag 5: This photo is also on a glassine bag, I added a puffy border and ampersand for a pop of interest. For the 6th Joy tag, I cut an FJ joy cut file three times and glued them together for dimension. 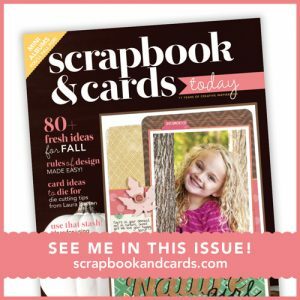 I also used copper glitter heat embossing to make a custom embellishment! 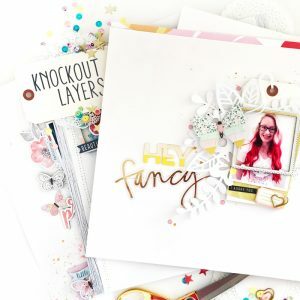 It looks super cute on the speech bubble journal card with a die cut sentiment, and puffy border added. Detail shot of the dimension created, simply by gluing cut files together! The next tag is a folded card; it is held closed by one of the Jumbo Felicity Jane Rose Gold paperclips! In the background, I stamped a piece of paper with the Love and Grateful stamps from the Amber stamp set. 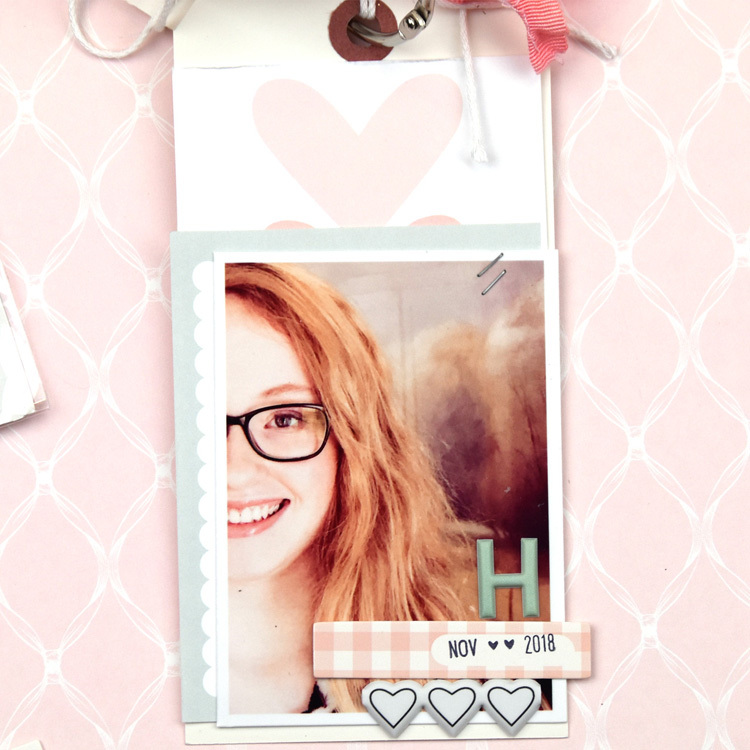 The final tag is a photo of Miss Pretty Hannah, I layered two of the journal cards with the photo and popped on an alpha, die cut and puffy border. A finishing stamp with the FJ roller date stamp was the perfect addition! 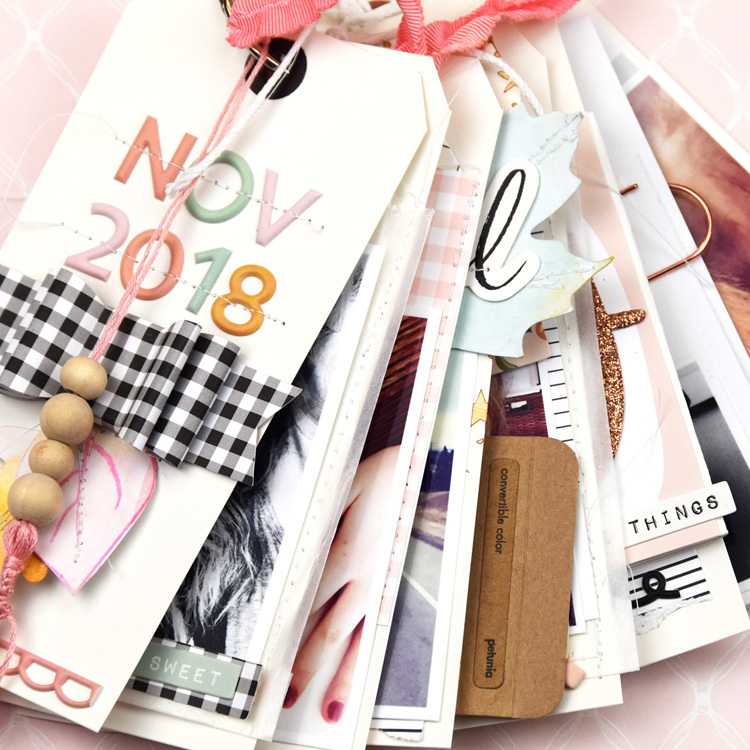 I love looking at little mini albums, it is a great way to keep your favorite photos or stories together, and the Felicity Jane kits make designing and decorating mini albums a breeze! !